But broadcasters are already reaping the benefits of remote production. San-Francisco based Pac-12,for example,provide live coverage of some 850 sporting events every year,across several states,and they mix these programmes on an audio console in a centralised production facility hundreds of miles away. This is the allure of remote production it offers broadcasters the ability to capture a much broader range of live events with minimal cost increases. It promises the ability to produce a program centrally,in a studio-based control room,improving the quality of monitoring and allowing more efficient utilisation of equipment and highly skilled personnel. This reduces the financial outlay of a full dedicated on-site team. And while there is no substitute for a skilled OB team,for niche programming such as local sports or local music events,remote broadcasting provides an incentive for broadcasters to increase their range of local programming. In these environments audio and video streams can be transported over backhaul technologies like IP or satellite uplink. And it is in this way that the audio operator can theoretically mix the programme mix in the comfort of their own studio,in their slippers. Why not? That said,if it were that simple,we'd all be doing it. And we're not all doing it, because it's not that simple. There are some major barriers to effective,reliable and manageable remote broadcasting: latency,control and infrastructure. The biggest single issue is latency. Broadcast audio workflows rely on quality monitor mixes with no latency,and over long distances total latency might be measured in seconds rather than milliseconds. Operators need real-time control over mic gains,fader levels and monitor mix levels,especially when they are geographically remote from all the action it's not always possible to physically check a connection or fix a mic position (especially in such luxuriously fluffy footwear). How are those bi-directional signals going to be transported and still be in sync with the video? And all in real time? And above all,how can all the control protocols required to mix a production remotely be managed as part of the network? These are challenges which are inherent in traditional broadcast audio infrastructures. But this isn't traditional broadcasting; the rise of reliable IP infrastructures have enabled both broadcasters and manufacturers to develop solutions to these challenges. Launched at NAB,Calrec's new RP1 core is a 2U rackmount box which addresses these problems. Primarily,RP1 provides local DSP to enable the generation of monitor mixes and IFBs with no latency. It gives an operator in a remote studio direct control over channel functions such as mic gains,aux send/monitor mix levels and fader levels. It also provides a mechanism to embed audio into existing backhaul technologies,such as SDI,as well as newer IPs like SMPTE 2022. The core contains Calrec's FPGA-based Bluefin2 processing,and it is this DSP engine that manages all the IFB routing and remote monitor mix levels at the venue. Local DSP means there is no latency for commentary or talkback,and it also makes it possible for remote mix engineers to set up IFB mixes and bus configuration on-site so that all venue infrastructure,routing and monitor feeds can be checked prior to establishing the link with the remote console at base. With DSP processing for monitor mixes taken care of on-site,the transmission console at base can concentrate purely on the main programme mix. This covers both latency & control. To solve any issues with infrastructure,RP1 embeds all transmission audio into existing video transport mechanisms; using an established video transport to embed the audio ensures that there are no synchronisation issues. RP1's modular I/O backbone accepts any Calrec's I/O cards which provides connectivity via analogue,AES,MADI,SDI,as well as the latest IP solutions from AES67,Ravenna,Dante,and SMPTE 2022. On the transmission console at base,all these remote I/O resources appear like any other local I/O box,so workflows are exactly the same as on any other broadcast which means there is no operator learning curve. With an increasing requirement for more content,at more locations,and with fewer resources,remote production is becoming a more attractive prospect to broadcasters. 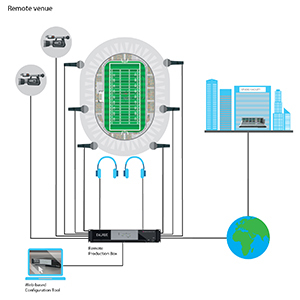 Some examples of remote broadcast environments are outlined in Fig. 1 and Fig. 2. Some sports,such as US college football,may be too regular and too expensive to cover with traditional outside broadcast units,or they may be of limited local interest. Remote production technologies allow more efficient utilisation of equipment and skilled on-site personnel. There is no requirement for a full team of audio engineers onsite at the venue; just a technician to check on-site connections. 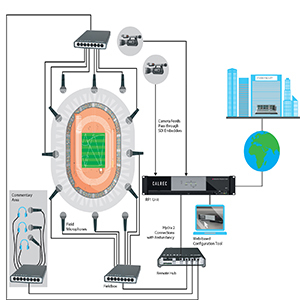 Audio connections can be made and tested in advance of a broadcast,and monitor feeds for on-site commentators can also be made in advance. The remote studio mixer can map RP1 controls onto the studio console,and commit this connectivity to memory to recall the same configuration at a later date. At a venue where there are a number of events happening simultaneously,such as an athletics event,a traditional outside broadcast truck may not have the capacity to provide coverage of all disciplines. Events will almost always have local commentary and so the creation of monitor feeds can be very complex,and often they will be made on location. RP1 allows IFBs to be set up in advance and processed on-site to eradicate latency.